Rare diseases, also known as orphan diseases, have become a major health burden in the recent times. Comprising 6000-7000 life threatening diseases, rare diseases affect small percentage of the population. Every country has their own definition of rare disease based on the country’s population. In the initial years, pharmaceutical companies were less interested in adopting them to develop treatments for such a small patient population, therefore the US FDA started giving orphan drug designations to the drug candidates intended to treat rare diseases. Orphan drug designations benefit companies from incentives for the development of these products until the marketing approval. The major challenge in rare diseases treatment is the lack of diagnosis, government policies, awareness and funding for R&D, along with long diagnostic delays. The global rare disease diagnostic market is segmented based on disease type, test type, age, trait, end-user, and region. The disease type segment is further sub-segmented into gastroenterology, endocrine and metabolism disorders, cardiovascular disorders, neurology, hematology and oncology, dermatology, and other therapeutic areas. The test type segment is further segmented as genetic tests, general lab tests, imaging, and other physical tests for rare diseases. On the basis of trait type, the rare disease diagnostic market is segmented as inherited and acquired. Based on the age group, the rare disease diagnostic market is segmented into children and adults. On the basis of end user, the rare disease diagnostic marker is segmented as hospital laboratories, diagnostic laboratory, genetic testing laboratories, cancer research laboratories, and others genetic services area. The market analysis includes an in-depth examination of the key ecosystem players, key strategies, and developments taking place in this market. Additionally, it includes market dynamics (market drivers, opportunities, and challenges) and industry analysis. Geographically, the market can be segmented into five distinct regions including, North America, Europe, Asia-Pacific, Latin America, and Middle East Africa (MEA). The purpose of the study is to gain a holistic view of the global rare disease diagnostic market in terms of various factors influencing it such as key market trends, competitive and regulatory aspects of the market, and scientific innovations with respect to gene sequencing. The scope of the report is centered upon conducting a detailed study of the diagnostic devices/services and assays used to diagnose rare disease. It involves wide range of diagnostic tests such as genetic tests (genome sequencing and exome sequencing), lab tests, imaging, and physical examinations that are performed in diagnostic laboratories, hospitals, cancer research institutes and other gene sequencing institutes/companies. The rare disease diagnostic market is divided into six different segments: diseases, test type, ‘trait, age, end user, and region. The report offers the reader with an opportunity to unlock comprehensive insights with respect to the market and helps in forming well informed strategic decisions. The research uncovers some of the substantial parameters that must be taken into consideration before entering the market. • What are the major market drivers, restraints, and opportunities in the global rare disease diagnostic market? • What were the market shares of the leading segments and sub-segments of the global rare disease diagnostic market in 2017, and what will be shares in 2025? • How will each segment of the global rare disease diagnostic market grow during the forecast period, and what will be the revenue generated by each of the segments by the end of 2025? • What are the major regulatory authorities/associations/consortiums affecting the global rare disease diagnostic market, and who are the key authorities facilitating development and approval of diagnostic products/services? • Which companies are holding gene sequencing services, and what is the epidemiology of the rare diseases? • What are the types of genetic tests involved in the diagnosis of rare diseases, and what is the market share for various test types performed in the diagnosis of rare diseases? • Which test type will be dominant among physicians for diagnosing rare diseases in terms of revenue? • Which disease type is expected to have the highest CAGR during the forecast period? • Which test type is expected to register the highest CAGR for the global rare disease diagnostic market? • Which end user is expected to register the highest CAGR for the global rare disease diagnostic market? • Which geographical region will contribute to the highest revenue for rare disease diagnosis during the forecast period? The report also profiles 15 companies including several key players that have been contributing significantly to the market. They key players of the market include Retrophin, Inc., 3billion, Inc., 23andMe, Inc., QIAGEN N.V., Illumina Inc., PerkinElmer, Inc., BGI, Partek, Inc., GENEWIZ, Centogene A.G., Strand Life Sciences Pvt Ltd., Eurofins Scientific, Laboratory Corporation of America, and Laboratory Corporation of America, among others. 16.12 Personal Genome Diagnostics, Inc.
16.15 Strand Life Sciences Pvt Ltd.
Rare diseases have become a major health burden in the recent times. Also known as orphan diseases, rare diseases are a group of 6000-7000 life threatening diseases affecting a small percentage of the population. Countries also have their own definition of rare disease based on the population. Rare diseases are also known as orphan diseases because pharmaceutical companies were less interested in adopting them to develop treatments for small patient population. The US FDA then decided to design drugs as orphan drugs and give incentives to encourage companies to develop diagnostics and treatment options for rare diseases. The major challenge in the case of rare diseases is the lack of diagnosis and treatment options, government policies, and funding for research and development. The purpose of the study is to gain a holistic view of the global rare disease diagnostics market in terms of various factors influencing it such as key market trends, competitive and regulatory aspects of the market, and scientific innovations with respect to gene sequencing. The scope of the report is centered upon conducting a detailed study of the diagnostic devices/services, assays used to diagnose rare diseases. Rare disease diagnosis involves wide range of diagnostic tests such as genetic tests, lab tests, imaging, physical examinations performed in diagnostic laboratories, hospitals, cancer research institutes and others. The rare disease diagnostics market is divided into six different segments: diseases, test type, trait, age, end user, and region. The report offers the reader with an opportunity to unlock comprehensive insights with respect to the market and helps in forming well-informed strategic decisions. The research uncovers some of the substantial parameters that must be taken into consideration before entering the market. 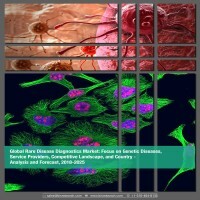 The global rare disease diagnostics market (by disease type) is currently dominated by hematology and oncology segment. The contribution of hematology and oncology segment was valued $10.0 billion in 2017 and is expected to reach $20.5 billion by 2025, witnessing a CAGR of 9.35% during the forecast period. Based on the trait type, the market is segmented into inherited and acquired. Based on the age group, the market is segmented into children and adults. About 80% of rare diseases are not acquired, they are inherited or has predisposition of faulty gene. The average time to diagnosis is approximately 5-6 years and 40% of rare diseases are misdiagnosed. Children account for 50 % of rare disease patients. According to the Canadian Organization of Rare Diseases, two-third of Canadians suffering from rare disease are children. Another extremely unfortunate fact is that thirty percent of children with rare diseases are not likely to reach their fifth birthday. Geographically, the market is segmented into five distinct regions including North America, Europe, Asia-Pacific, Latin America, and Middle East Africa (MEA). North America, followed by Europe, is the leading contributor of the market. Within North America, the U.S. contributed for almost 91.12% of the total share, and the rest was occupied by Canada in 2017. Within Europe, the U.K dominated the market in 2017. However, the market for the Asia-pacific region is expected to demonstrate high growth rate during the forecast period from 2018 to 2025, as compared to other regions, and the region holds a strong potential for market expansion in the future. The rare disease diagnostics market (by genetic tests) has a promising potential for growth in the coming years. The report provides an in-depth SWOT analysis of different key players of the market, supported by extensive financial summary of each company. The key players of the market include Retrophin, Inc., QIAGEN N.V., Illumina Inc., PerkinElmer, Inc., BGI, Partek, Inc., Centogene A.G., Strand Life Sciences Pvt Ltd., Eurofins Scientific, Laboratory Corporation of America, and Laboratory Corporation of America, among others.